I was recently preparing a presentation and came across a presentation I gave to a small meetup in London in 2013. While there were only 100 or so people in the live audience that day, the presentation has now probably been seen by a hundred thousand people – between Slideshare, a video of a webinar version, and the blog post I wrote about it at the time. When I stumbled back across it, I found it interesting to look back on because it made a bunch of predictions about the next 10 years and now, in 2018, we are halfway through those 10 years. I was struck by how time has flown and I thought it would be interesting to do a midway-point review of what I was thinking in 2013. I also thought I could use some of the information it gives us about the pace of technology change and user behaviour change to attempt to understand current trends better – particularly around voice interfaces and voice search. I’m going to run through my predictions and how I think they’re coming along, but I also wanted to give you a preview of where my argument is going. 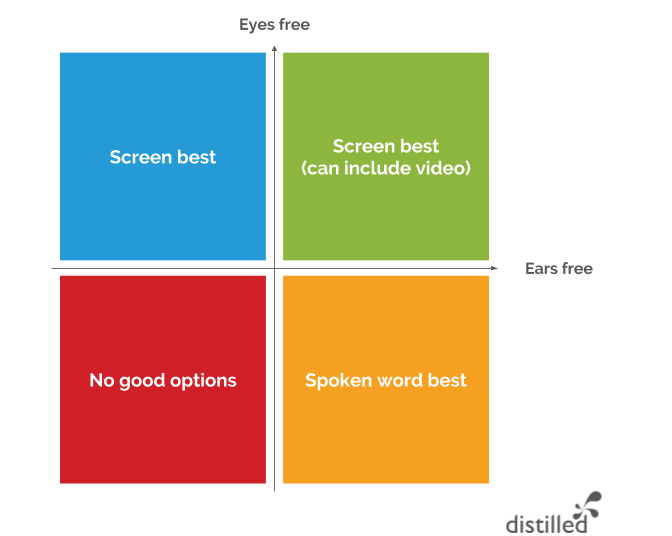 Ultimately, while I think that voice recognition technology has become incredibly good at recognising words and sentences, there are a variety of things that will prevent it quickly cannibalising the rest of search in the short term. This is true of voice interaction generally in my opinion, but is especially true in search where I believe voice is mainly incremental (and isn’t even responsible for anything like all the incremental query growth). The bulk of the general argument is made very well by Ben Evans in his article voice and the uncanny valley of AI (though these response and rebuttal articles are worth a read too). How do we want to consume information? How do we want to enter information? In my view, the constraints that voice isn’t always a convenient input, and speech isn’t always a great output place a natural ceiling on the usefulness of voice search – even beyond the issues Evans identified – and they are heightened for what I’m calling real searches. My view is that the majority (if not the vast majority) of what are currently being called “voice searches” in the stats aren’t much like what search marketers think of as searches. When Sundar said in 2016 that 20% of mobile searches in the Google app and on Android were voice searches, my bet is that 75%+ of those were incremental and not “real” searches. They were things you couldn’t do via “search” before and that are naturally done by voice – such as “OK Google, set a timer for 20 minutes”. The interesting thing about these “searches” and the reason I’m classifying them differently is that they are utterly uncommercial. Not only are you never going to “rank” for them, there is literally no intent to discover any kind of information or learn anything at all. They’re only really called searches because you’re doing them with / through Google. Before I finish making those arguments, let’s look back at the presentation I opened with. I started by putting my 10-year predictions into context by looking back 10 years (to 2003 – this was 2013, remember). Now, I put this initial presentation together for a relatively small meet-up, so I didn’t turn them into completely quantitative and falsifiable projections – though if anyone thinks I’m substantially wrong, I’m still up for hashing out more quantifiable versions of them for the next five years. In that context, here are my main predictions for 2023. We’re now halfway there. How do you think I’m doing? I’m feeling pretty good about those three. Despite the growth of new input technologies, the growth of video, and the convenience of hardware like airpods making it easier and easier to listen to bits of audio in more places, it doesn’t seem likely to me that any of these are going anywhere. I mean. This was kinda cheating. Hard to imagine it going the other way. But the growth of everything from Netflix to the New York Times has continued apace. I’m not 100% sure what the end-game looks like for media subscriptions. I feel that there has to be some bundling on the horizon somewhere, as I would definitely pay something for a subscription to my second, third, and fourth preference news sources, but there is no good way to do this right now where it’s a primary subscription or nothing. I think that the whole net neutrality issue (interesting take) is pretty good evidence of the continuing ambitions (and, so far, failures) of the “pipes” of the internet to be much more. Having said that, I didn’t get into anything nearly granular enough to count as a falsifiable prediction. I think this is probably the biggest miss. Although there are some core network issues, home and mobile connection speeds have generally continued to improve, and where they haven’t, the problem actually does still lie in the last mile. I suspect that as we move through the next five years to 2023, we will see a continuing divide with speeds continuing to increase (and not being a blocker to advanced new services like 4K streaming) in urban / wealthy / dense enough areas, while rural and poorer areas will continue to lag. In the UK, the smaller size and higher density means that we are already seeing 4G mobile technology cover some areas that don’t have great wired broadband. This trend will no doubt continue, but the huge size and scale of the US means that there will continue to be some unique challenges there. This prediction was part of a broader hypothesis I developed and refined in 2013-2014 around the future of TV advertising. The key prediction of that was that $14-25bn /yr of TV ad spend will move out of TV in the US in the next 5 years. We’re about to see what the 2018 upfronts look like, but we’ve already seen a ~$6bn drop. It’ll be interesting to see what 2019 holds and then come back to this in 2023. The majority of my predictions were directional and not that controversial, but the point I was seeking to make with the first few was that technology and usage generally changes a little slower than we anticipate. I think this is particularly true in voice, especially when it comes to search, and spectacularly true when it comes to commercially-interesting searches (including true informational searches). At a high level, the same arguments I made in 2013 about the suitability of the different kinds of input and output apply to put some kind of cap or ceiling on the ultimate percentage of queries that will eventually shift to voice. Along with that, the experience of what things changed and what stayed the same 2003-2013 and again 2013-2018 remind us that certain kinds of behaviour always change more slowly than we might imagine they will. All of that combines to remind us that even in the bullish predictions for voice search growth, most will be incremental and so little of it is to the detriment of existing search marketing channels (I wrote more about this in my piece the next trillion searches). So how many voice searches might there be? And how many are actually real searches (rather than voice controls)? Of those, how many are in any way competitive or commercial? And of those, how many give a significantly different result to the closest-equivalent text search, and hence need any kind of different marketing approach? Google talked about 20% of mobile searches being voice in 2016. Let’s assume that’s up 50% since then. 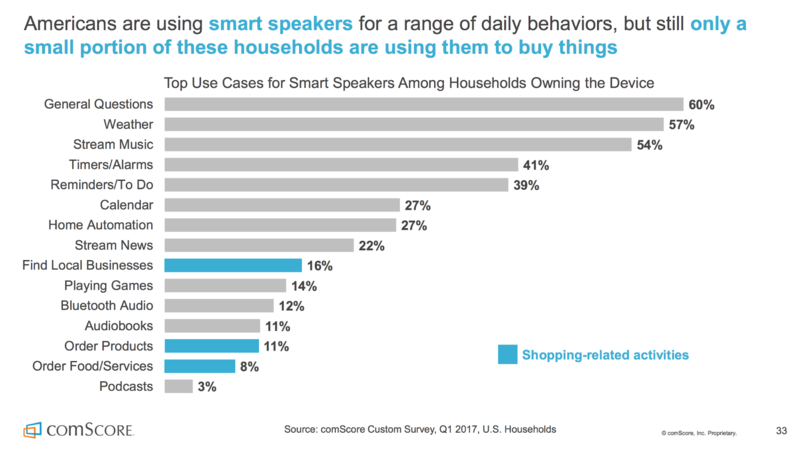 There are then another fraction of that which will be voice searches on other devices (smart speakers, watches?, laptops). Still to come: 400 million (the rest of the “next trillion”): unfulfilled search demand – queries you can’t do yet. Image searches. New devices. New kinds of searches. Some fraction of these will be voice too. So – 600 million voice “searches”. Unfortunately, there is little “keyword” data for voice to validate this estimation. We simply don’t know how often people perform which different kinds of queries and controls. 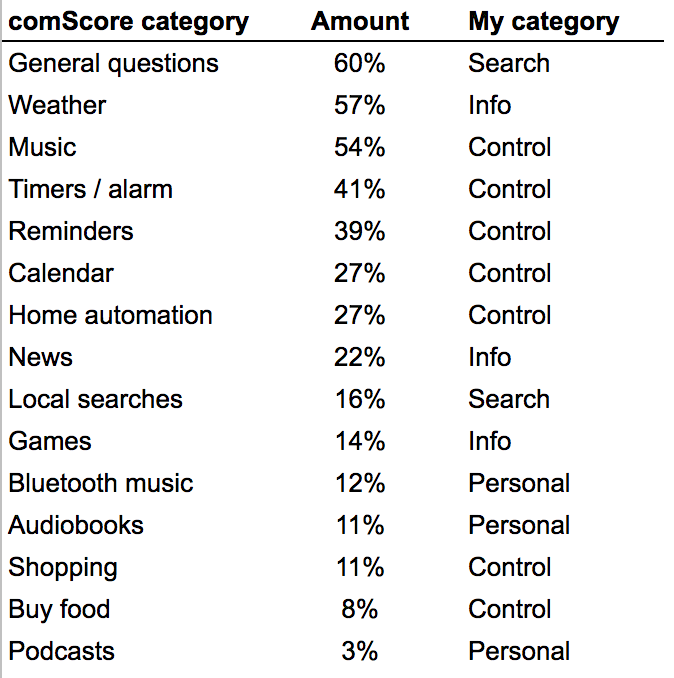 Most of the research (example 1, example 2) has focused on questions such as “which of the following activities do you use voice search / control for?” or “what tasks do you perform on your smart speaker?” (neither of which capture frequency). While there is some clever estimation you can do with regular keyword research tools, there is little in the way of benchmarking. It’s those 4. c & d that provide a marketing opportunity equivalent to most typed searches (and of course, just like on desktop, many of those are uncompetitive for various reasons – because they are branded, navigational, or have only one obvious “right” answer). But even with those included, we’re looking at global search volume of the order of 12-15 million queries / year. Is less than 1 million searches / year globally at this point. What market share of ~100k searches / month across all industries do you think your organisation might be able to capture? How much effort is it worth putting into that? Customer success / retention / happiness for consumer companies – there are a bunch of areas where skills / integrations can make sense as a way to keep your customers or users engaged with you / your service / your app. These might perform like searches that no-one else has access to once your users are using your skill. An example of this is grocery shopping. At the same time, I would be tempted to argue that most of that is not truly search in any particularly meaningful sense. Of course, it’s completely possible that I’m just wrong on the scale of the opportunity – Andrew Ng of Baidu (formerly of Google Brain) believes that 50% of all (not just mobile) searches will be voice by 2020 (or at least he did in 2016!). I haven’t seen an updated stat from him and while I am inclined to think that’s too high, you might disagree and I would understand if you thought Ng’s credentials and access to deeper data were stronger than mine here! (Note you’ll also see this prediction bandied around a lot attributed to comScore but as far as I can tell, they just repeated Ng’s assertion). Disagree? Want to argue with me? Please do – I’d love to hear other opinions – either in the comments below or on twitter where I’m @willcritchlow.